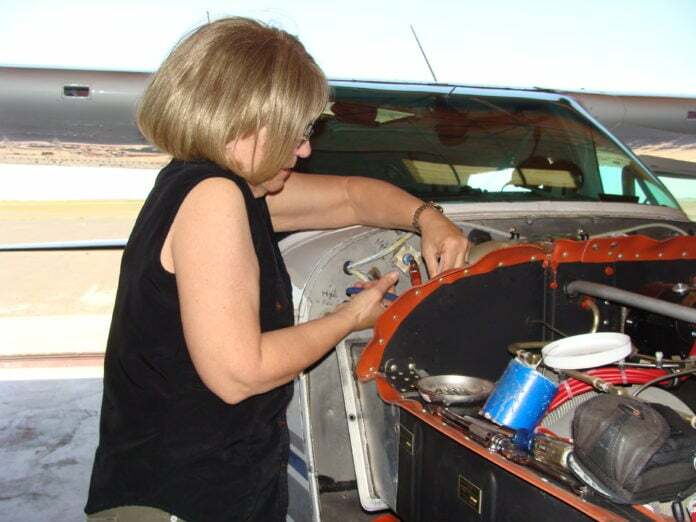 Mary Latimer works on a airplane engine. LANCASTER—Mary Latimer is an aviator with a mission. She is a veritable fireball with a lengthy and impressive roster of projects-at-hand and lofty goals that she plans to achieve; don’t tell her it could take three lifetimes to accomplish them all-it will just make her fly faster. The Texas native began breaking down barriers, opening doors and becoming a role model for other women in aviation before she realized that barriers and doors existed, or understood the need for role models. When she enrolled in January of 1973, Mary was the only female out of 125 students. She made the highest grades of any graduate and was the only one in her class to complete the course without delays. While going to school, she bought an airplane; this would allow her to build flying time and shorten her commute, she reasoned, as the school was 50 miles from her home. Shortly after, however, Lady Luck prevailed when Mary discovered that a local pilot had cleaned out his hangar and donated a lot of “junk” to the school. She then found donated lift struts that the school was going to use for welding class practice. 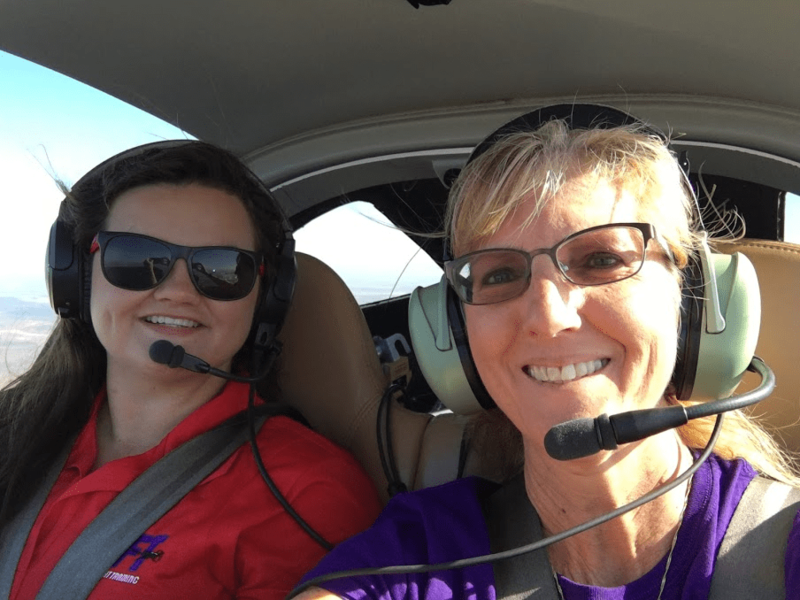 Lydia Shorey, Certified Flight Instructor and Bonnie Coffey in a DA-20 airplane. By the summer of 1974, Mary was 20 and had earned her A&P certificates, commercial pilot certificate and flight instructor certificates. Reality hit, however, as she tried to find a job in the aviation industry, as she experienced barriers and doors that were closed to her. Some were because she was female but, at the time, the airlines had a height requirement of 5′ 6″ –and Mary was 5’0″! The Wichita Falls FSS manager had been encouraging Mary to apply to become an air traffic controller. After an 18-month ordeal of applying and testing but still hitting barriers, she was accepted and began ATC school, in 1976. While waiting for the FAA, she found an aviation job in McAlester, OK, where she worked as a pilot, mechanic and instructor, until she received the call to become an air traffic controller. Again, she was the only female in her class and graduated second in the class and became the first female controller in Lawton. In June, 1977, Mary earned her Inspection Authorization. Members of the Girls in Flight Training (GIFT) Academy GIFT group captured by Latimer’s new drone. She was proud of this accomplishment, as even getting the authorization to take the test had involved FAA legal counsel “ordering” the FSDO to administer the test to her. She never believed she was the first woman to earn this certificate, but started to consider the possibility when another female claimed to be the first woman IA about a year later. Now a controller. Mary also taught dozens of safety seminars, until she retired from the FAA, in 2002. Today, she and Lawrence run Latimer Services, at the Wilbarger County Airport in Vernon, TX, a business they began in 1970. Mary has now partially—or fully-trained “hundreds” of pilots and, as a DPE has tested more than 600! Among her awards are 2014 Southwest Region Flight Instructor of the Year; 2014 Flight Training Excellence; AOPA President’s Choice Award; 2014 International Forest of Friendship; and the 2015 Lubbock FSDO FAAST Representative of the Year. Recalling her path, Mary says there seemed to be three reactions to her aviation endeavors– equally divided between disbelief, animosity and encouragement. The encouragement was deeply appreciated and was crucial to her progress and success. The disbelief could be dealt with by demonstrating her skill, talent and commitment. The animosity and overt sexism was mostly ignored, and Mary did not allow it to interfere with her training or career. In fact, she took pride in proving naysayers wrong, outperforming those who tried to sabotage her career, earning the respect and admiration of the disbelievers and proving that being a female is not a limiting factor for a career in aviation.